Rickshaw Unschooling: Eleven years ago this very moment. Eleven years ago this very moment, at 10:55 in the morning, my powerful child came swooshing out into the world and I caught her with my own hands. I lifted her up and shouted "It's mine! She's mine! She's my girl!!!" We have a tradition in our family of telling the kids about their births during the days that surround their birthdays. The little stories all begin with something like this: "Eleven years ago this very moment..." and end with the details: "...Tali and Nana were making applesauce in the kitchen", or "...we decided to go get on the ferry and head for the hospital," or "...I was sitting in the bath at the hospital, leaning on Pappa," or "...I told the nurse I felt you moving down", etc. The story goes on for days, and we all delight in remembering. 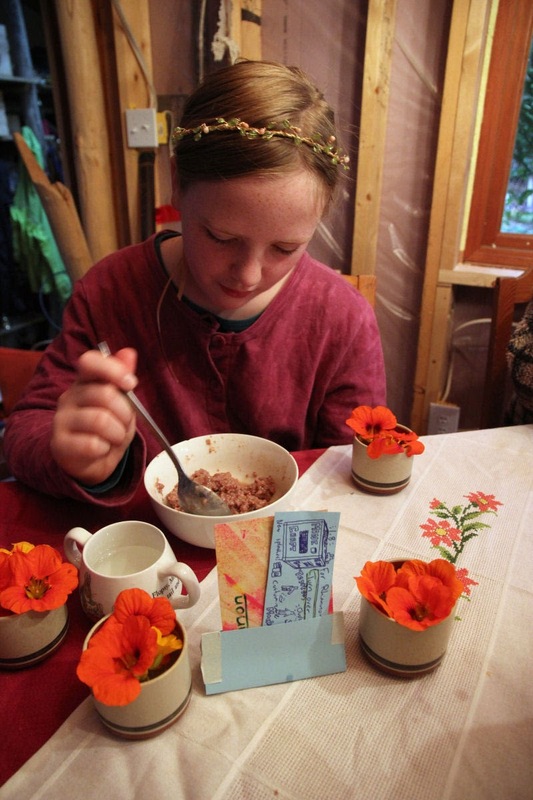 Hurried rice porridge and Tali's flowers and card on her birthday school morning. But this year my beautiful daughter isn't home! For the first time ever, she's attending a part-time school program, and has gleefully brought cupcakes to share with her class. She loves her independence there, and didn't even want me to drop her off at school. So at this moment, I can't tell her "...and I lifted your little purple body up onto my chest, while Nana and Pappa came running in the door". I can't describe to her how it was to snuggle her little sticky self all up in my arms as all the doctors and nurses came hurrying into the room in a panic and we were just fine. I can't tell her how they wiped her face and how dark reddish brown it became - and stayed - and how I smooshed my lips against her beautiful soft head and cried for the joy of holding her, or how Pappa and Nana kissed us so lovingly, and Pappa declared that her name would be Rhiannon. Rhiannon Raven. And that was that, and I smiled and said "Annie" and it was all perfect. Parenting isn't always perfect. How could we ever grow and develop if there weren't a hundred thousand hurdles to keep us leaping all the way? My daughter is a force to be reckoned with, and also sometimes like the softness of a warm wind that keeps me steady and sure as she wraps her arms around me and reminds me that there is always love. I can't tell her these things right now, but I will. Today as I bake her birthday quince pie, I will re-live the memories myself, and tonight when I tuck her in I will sing her the song her Nana wrote for her, and tell her about my day: The day she was born and the present day that I spent thinking about the wonderful gift of her presence in my life. Thank you, Annie, for being mine. When the doctors rushed in you said "we don't need you, we're all finished here". But you were really only beginning. Such a wonderful time with a very special girl, baby Rhiannon, golden Rhiannon our shining Rhiannon was born.